"Carte de la Louisiane et du Cours du Mississipi." From Jean Frederic Bernard's Recueil de Voiages au Nord. Amsterdam: J.F. Bernard, 1734. 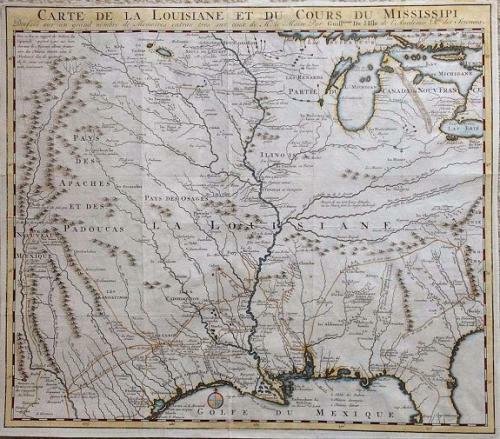 This is a reduced-size edition of Delisle's influential map of the French possession of Louisiana. Delisle is known as the "father of scientific cartography" for his production of maps based upon scientific principles and his role in establishing this as the standard for all cartographers. Delisle's maps had an immense impact on the history of cartography, and none more so than this map which was first issued in 1718. It is seminal in the history of the mapping of America exactly because of Delisle's pioneering method and attitude. It was based on years of research, using all the latest reports of travels, explorations and surveys in the region. Delisle was particularly well placed with respect to gathering information on North America, for with his connections in the French court, especially within the Ministry of Marine, he had access to all the official and unofficial reports coming out of New France. It is not surprising, then, given Delisle's method and connections, that this map is so important in the cartographic history of the continent. This map is Delisle's final statement on the mapping of America and one of the most influential American maps ever produced. It is a map of superior delineations and many firsts. It contains the first indications of the explorations of De Soto, Cavelier, Tonty, Moscoso and Denis. It includes the best depiction of the Mississippi River of the first part of the eighteenth century, as Delisle for the first time presented a roughly accurate delineation of its entire length as well as a semblance of accuracy about many of the tributaries such as the Ohio, the Missouri, the Platt, and the Arkansas. It is on Delisle's map that the name Texas first appeared in print, with the legend "Mission de los Teijas," indicating a mission established in 1716. In very good condition with original folds and remnants of mounting paper to the verso. Some images show the framed map, but the item is sold out of the frame.